Sheikh Nasir Muhammad Al-Mukhtar Kabara, a noted Islamic scholar and philosopher was born in 1912 in Guringawa village outside Kano, Nigeria. His grandparents came from Kabara, a town under Timbuktu kingdom. His third generation grandfather — also from Kabara in Timbuktu — Mallam Omar, also known as Mallam Kabara was the only one from the lineage to settle in Adakawa in Kano city, before moving on to what is now known as Kabara ward, named after him. He was an accomplished Sufi in Timbuktu before departing for Kano. The first thing Mallam Kabara did on settling in Kabara ward was to establish a school in 1787, of a sort commonly referred as (Zaure) School where the outer entrance hall of his house was converted into an Islamic school. This school possibly among the oldest recorded schools in Kano is now part of the Darul Qadiriyya household of Sheikh Nasir Kabara. The sheikh was extremely enthusiastic in his search for knowledge. His first encounter with advanced Islamic learning system — long after he had graduated from the normal Allo (Qur’an read from wooden slates) schooling system, emerging extremely fluent in Arabic language, Islamic jurisprudence and Linguistics — was with Bad’ul Amli and Murshida, both treatises on Tauhidi; the unity of God. Next followed a voracious apepite for other books and soon he had completed his studies of Ahlari, Iziyya and Risala: all books necessary for a proper understanding of Islam. Because in Islam there is no concept of copyright, soon after the sheikh was himself typesetting the Risala and Ishiriniya (book of poetry in praise of the Prophet) and selling them. His learning process was essentially self-motivated; with of course appropriate encouragement from his main teacher: Mallam Natsugune. Consequently, the youthful sheikh was a voracious searcher of Islamic knowledge, being far ahead of his contemporaries — indeed he was actually preaching to his classmates his advanced understanding of the meaning of the Qur’an; thus sowing the early seeds of his entry into Tafsir at such tender age. In Kano of that era — 1920s — there were five advanced schools; essentially what can be considered pre-university schools now — where the sheikh used to go, on his own, to further his knowledge. These schools had extensive reference libraries containing collections obtained from various North African scholastic centers. All form the central core of sheikh Nasiru’s thirst for further knowledge. Even at that age, his acquisition of knowledge was more than rote learning; he questioned what he did not understand from his teacher; thus being extremely revolutionary in his understanding of Islamic knowledge. The traditional perception of the relationship between the pupil and the master in the Islamic schooling system rarely gives room for interactive acquisition of the knowledge. sheikh Nasir did not accept such didactic relationship, and consequently, with diffidence and respect, always requests for further elaboration of what he did not understand of what he learnt from his teachers — who themselves were only too willing to oblige the young scholar. This was not surprising, even in the “archaic” 1930s Kano, considering the fact that some of his other teachers were graduates of the Al-Azhar University in Cairo, the oldest university in Africa. Thus Sheikh Nasir Kabara combined two intellectual traditions: his Timbuktu ancestry when Timbuktu itself was a citadel of learning in the Sudan; and his contact with visiting scholars and professors from Al-Azhar in the 1930s in Kano. Among the local residents in Kano who joined the Qadiriyya at this time (1937) was a young lad, Shaikh Muhammad Nasir Kabara, who was destined to bring great changes in the tariqa and not only to introduce the celebration of the birthday of Shaikh Abd al-Qadir al-Jilani, a festival which was not practiced by the North Africans, but also to carry the use of bandiri to every corner of Hausa land.At the age of seventeen, Shaikh Muhammad Nasir was really too young to be accepted as a member of the Qadiriyya but, as his grandfather, Mallam Nakabara — an extremely well learned Mallam — wished him to enter the order, Shaikh Sa’ad had a little choice but to give him the wazifa. Although a youth, sheikh Nasir was not only well read in classical Arabic literature and sciences but he was also conversant with the learning of Sufism and the works of the leading sufi scholars of the time.When the Amir of Kano Abdullahi Bayero went on the hajj Sheikh Nasir sent a letter through Wali Sulaiman to the Khalifa of the Qadiriyya, Shaykh Abu al-Hassan as-Samman, the grandson of the founder of the Sammaniyya, asking him to give him an ijaza to become muqaddam of his own zawiya. The Shaykh was astonished to hear of such a highly learned youth and he sent a jubba and cap to shaykh Nasir together with a letter of appointment as a muqaddam. Although shaykh Nasir did not immediately separate himself from the community in Alfindiki, as Shaikh Sa’ad was still alive, his actions were regarded as innovations by the Arabs. In 1949 shaykh Nasir made the Hajj and met the new Khalifa, Shaikh Hashim and Shaikh Muhammad of Mauritania. On his return journey, he visited the Sudan, where he met with Sayyidi Shaikh Muhammad al-Fatih bin. Shaikh Qaribullah, grand Shaikh of the Sudanese Sammaniyya, and collect the Ijaza of As-Sammaniyyal-Qaribiyya secondly. He also visited other Arab countries where he learnt many things concerning the hadra and bandiri organization. By 1950 Sheikh Nasir was in many ways far more versatile and eclectic than his teachers; and having successfully made Sufism acceptable to wider audience, he was thus able to make Qadiriyya penetrate into every part of the country. Thus since about 1958 Sheikh Nasir Kabara has been con¬sidered the leader of all branches of Qadiriyya in Kano. The lines of authority within the leadership structure, however, may be viewed in terms of both the individuals whose authority extends over several branches and the particular patterns within each branch. Sheikh Nasir Kabara received his original authority in Kuntiyya and Ahl al Dar from Ibrahim Na tsugune, who was the dominant figure linking nineteenth¬ and twentieth century Qadiriyya in Kano. Ibrahim (ca. 1867 1941) was Fulani and his grandfather was originally from Katsina. He learned a wide range of subjects from his father: law, theology, literature, logic, and grammar. He learned astrology from Mahmud Kabara; law (the Mukhtasar) from the babban mallami, Abdurrahman al Suyudi; and sufism (especially Qadiriyya) from his father and from Ibrahim of Zaria, who had come to Kano. By the age of thirty, he had become a legal adviser to Emir Aliyu. He was offered the position of alkali (judge) but refused on the conviction that mallams should not be involved in government. He did not travel outside Kano and continued his position as legal adviser under emirs Abbas, Usman, and Abdullahi Bayero. He was also the personal mallarn of Emir Usman. Ibrahim did not write books, although he did possess his own written commentaries on the Mukhtasar. His home in Kabara ward was a center of higher learning in Hausa land. One section of his compound was set aside for studies of theology and mysticism, and another section was set aside for studying law. He was not an ardent proponent of solitude (khalwa). Although there were other leaders of tradi¬tional Qadiriyya in Kano during this period, Ibrahim’s authority was rein¬forced by his personal qualities of piety and knowledge and by his effectiveness as a teacher of mallams. He was not succeeded in this authority by his son but by his student Sheikh Nasiru Kabara, who exhibited these same qualities. During the period from 1935 to 1955, shaykh Nasiru was successful in establishing direct contact with the primary sources of Qadiriyya authority in Khartoum, Timbuktu, and Baghdad; and thus he became increasingly independent of Traditional Qadiriyya lines of authority. His trip to Baghdad in 1953 was a turning point in his career. It established his authority directly within the international headquarters of Qadiriyya; while in Baghdad he studied classical and modern aspects of Qadiriyya, and subsequently he introduced or in¬terpreted much of this material for a Nigerian audience; his sole traveling companion to Baghdad was the wealthy merchant, Sanusi Dantata. As a result of the trip, shaykh Nasir secured the financial support for his campaign to re¬form Qadiriyya and extend it to a mass level. Upon his return from Baghdad, sheikh opened his own Qadiriyya mosque and declined to attend the mosque of Muhammad Sidi. By 1956 most of the leadership and laity had aligned with Shaikh. and a rapprochement was reached with Muhammad Sidi. During this period Nasir traveled throughout northern Nigeria opening mosques and appointing muqaddams. He also nurtured his contacts in the Arab world, returning twice to Baghdad and visiting Khartoum, Cairo, Beirut, Damascus, Tehran, and Amman. In 1958 he was appointed headmaster of Shahuci judicial School and Library in Kano. In 1961 he opened his own Islamiyya Senior Primary School in Gwale ward and has continued teaching advanced subjects in his own home. In 1949 sheikh was appointed to the emir’s Council of Advisers by Abdullahi Bayero. When Muhammad Sanusi became emir in 1954, however,Shaykh was replaced on the council by Reformed Tijani mallams. During the reign of Sanusi, shaykh served as a legal consultant to the Northern Muslim Court of Appeal and continued as one of the two tafsir readers in the palace (q.v.). With the appointment of Ado Bayero as emir in 1963, shaykh Nasiru again became an adviser to the emir. Since 1963 he has been a member of the Kaduna Council of Mallams and has been on numerous local and regional committees, ranging from the Kano Native Authority Committee on Prostitution to the Northern Nigerian Special Committee on Education in Kano Province. Despite his involvement as a government mallam, Sheikh Nasiru Kabara has main¬tained a base of authority independent of the administrative structures in Kano and northern Nigeria. He has been largely responsible for making Qadiriyya acceptable to the common man, both Fulani and Hausa, and has been an im¬portant intermediary between the Fulani ruling class and the Hausa com¬moner. He has translated the theology and mysticism of Qadiriyya into the Hausa idiom. In addition to the functions of initiation, training, and intermediation, the Qadiriyya leadership in Kano has responsibility for financing and organizing the various activities of the brotherhood and for communicating with all segments of the brotherhood, local and national. In the transformation of the brotherhood from an elite to a mass organization, a major leadership function has been the inspiration and adminis¬tration of ritual. Reformed Qadiriyya has placed a special emphasis on group celebration of the founder’s birthday (Mauludin shaykh Abdulkadir). This ceremony is specifically identified with Reformed Qadiriyya and was initiated in Kano by Sheikh Nasir Kabara in about 1959. It serves as a yearly meeting for brotherhood leaders and members from throughout northern Nigeria. Delegations from each of the major northern cities congregate in Kano for a full day of prayers and activities. The central feature of the day is a group procession, arranged by area delegations, from the home of Sheikh Nasiru Kabara in the Jarkasa area of Kabara ward to the Kano Qadiriyya burial ground west of Kano City, where prayers are said over the graves of Kano Qadiriyya saints. The procession also serves as the only time in the year when men, women, and children all participate in the same worship service. The order of procession indicates roughly the hierarchy of authority within the Qadiriyya elite; there is an inner core of muqaddams who accompany Sheikh Nasiru Kabara during this period. (1) Association with Qadiriyya in the nineteenth century was limited to Fulani mallams and administrators (who derived their authority from the leaders of the Fulani Jihad) and to North African Arabs (who did not integrate themselves religiously into the Kano Milieu). (2) With the establishment of colonial rule, elements in the Kano Arab community reaffirmed their own spiritual links with North African sources of spiritual authority. (3) Members of the Hausa mallam class began to associate with this renewed form of North African Qadiriyya and were recruited into leadership positions within one generation. (4) Part of the success of Qadiriyya in the Hausa sector was due to an emphasis on group worship and the focusing of activities within local mosques. (5) The “legitimate” successor to the leadership of traditional Fulani Qadiriyya in Kano (Sheikh Nasiru Kabara) affiliated with independent lines of Qadiriyya authority as a reinforcement of his “inherited” authority and sought to consolidate the Arab, Hausa, and Fulani sections of Qadiriyya. (6) This was accomplished partly by extending Qadiriyya from an elite base to a mass base. In this process, the support of wealthy Hausa merchants was essential. On the mass level, Reformed Qadiriyya was also a redaction of emerging Kano nationalism which demanded that religious au¬thority be shifted from Sokoto and North Africa to Kano itself. (7) Because of the mass base of Reformed Qadiriyya, it was no longer possible for the Qadiriyya elite to identify completely with the Kano ruling class. Thus, while brotherhood leaders might act as advisers to the ruling class, they have usually guarded their status as nongovernment mallams. (8) Perhaps as a consequence of the shift from an elite to a mass base, the brotherhood leadership became in¬volved in two relatively new functions: the interpretation of doctrine for local use and the inspiration, through ritual and ceremony, of group and mass worship. Doctrines of Authority and Community in Reformed QadiriyyaWhereas Traditional Qadiriyya in Kano relied heavily on the nineteenth¬ century Jihad writings as the major sources of Qadiriyya doctrine the leaders of Reformed Qadiriyya have themselves been prolific writers. Like the Fulani Jihad writers, the contemporary Qadiriyya writers are concerned to relate classical Islamic thought to local circumstances. In the interim period between the Jihad writings and the contemporary writings, there was “a dearth of Qadiriyya literature in Kano. None of the major leaders during this period, ¬Ibrahim na Kabara, Ali Musa, Saad b. Ahmad, Sharif Garba, Sidi Muhammad, and Muhammad Sidi wrote on Qadiriyya. The Reformed Qadiriyya move¬ment, associated with Sheikh Nasiru Kabara and Ahmad b. Ali, has not only pro¬duced its own literature but has revived an interest in the Jihad classics,” has introduced works on Qadiriyya from the Arab world,” and has inspired local Hausa “praise poets” “ to express themselves on brotherhood matters. Sheikh Nasir Kabara has written about 200 works in all. 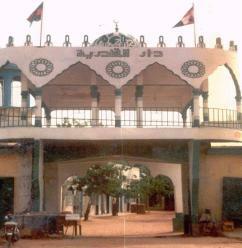 The writings of brotherhood leaders such as Sheikh Nasiru Kabara and Ahmad b. Ali espouse the community and authority of Qadiriyya on two major grounds: affiliational (primarily on the basis of direct personal experience) and communal (primarily on the basis of loyalty to the nineteenth century Jihad tradition). Within the category of affiliational appeal, there have been five areas of doctrinal exposition: the origins and spread of Qadiriyya, the elements and requirements of Qadiriyya, the benefits and blessings for those who follow Qadiriyya, personal praise of the Qadiriyya saints, and general preaching. With regard to the spread of Qadiriyy, Sheikh Nasiru Kabara describes in Al¬nafahat the Qadiriyya shaykhs in history and the distribution of Qadiriyya among the continents of the world.” In Naf’ al ‘ibad, he discusses the Qadiriyya caliphate throughout history. In Ithaf al khald’iq he presents the genealogy of the founder, shaykh‘Abd al Qadir, and a considerable amount of biographical data. He also mentions some of the successors of shaykh ‘Abd al Qadir in the contemporary world.